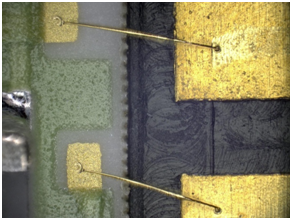 For many years, wire bonding has been the most robust and commonly used method for chip-to-die interconnection of lead-frame, integrated circuit (IC) packages, RF microwave packages and optoelectronic packages. A question often gets asked concerning what kind of application we use: ball bond or wedge bond? Why would a process engineer choose a wedge bonder over a ball bonder or vice versa? This has been the question by most process engineers because, generally speaking, electrical characteristics of the package are affected by the method of wire bonding. However, there are cases where certain packages have physical constraints such as temperature limitation (low heat or no heat applications), use of aluminum wire instead of gold, use of ribbon instead of wire and fine pitch application. This is where the proper selection of wire bond process comes into play. Typically, “ball bonding” applications are associated with thermocompression (T/C) and thermosonic (T/S) joining methods. T/C utilizes pressure and temperature from about 150 degrees C (for most common applications) to create an intermetallic bond. T/S, on the other hand, adds ultrasonic energy from the previous process. With both methods, however, a “free air ball” is being created by a spark from an “electronic flame off” or EFO underneath the capillary before bonding takes place. This free air ball then gets deformed when the capillary touches the surface of the bond pad and applies force and ultrasonics with a given amount of time to deform the ball. Thus the inter-diffusion between the wire and the bond pad metallization occurs, which makes the intermetallic bond. In general, “ball bonding” offers faster speeds of about 5-12+ wires per second. Types of wire used for this application include gold, palladium-coated and copper wires. 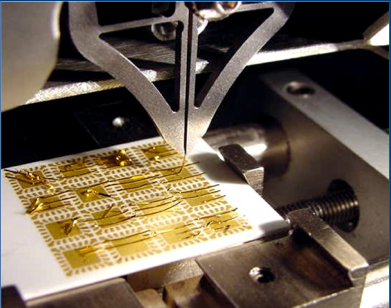 Typical packages and applications for this process include BGA, QFP, SOP, MCM hybrids and wafer level bumping. The ball bonding process is suited for fine pitch applications down to 40 microns or less. The wedge bonding process, on the other hand, utilizes ultrasonic energy and pressure to create a bond between the wire and the bond pad. When gold wire is used, wedge bonding uses temperatures up to 150 degrees C, and similar to ball bonding this technique is called thermosonic (T/S) bonding. The most predominant process for wedge bonding is a low temperature process or ambient temperature bonding, where aluminum wire is used to make the interconnection of the die and package. This “welding process” (either hot or cold) deforms the wire into a flat elongated shape of a wedge, however depending on the type of wedge tool used, the shape can sometimes have a cross groove (typically for 1 mil gold wire). Unlike ball bonding, the first bond for a wedge bond does not have a ball, which is why this wire bonding process is called wedge-wedge bonding. The absence of the ball on the first bond gives wedge bonding an advantage for much finer pitch applications of 40 microns or less. Aluminum wire is the most predominant wire used for this process, followed by gold wire. Typical packages and applications include high-power applications, RF microwave, optoelectronic packaging, BGA, QFP, SOP, MCM hybrids and temperature-sensitive applications. 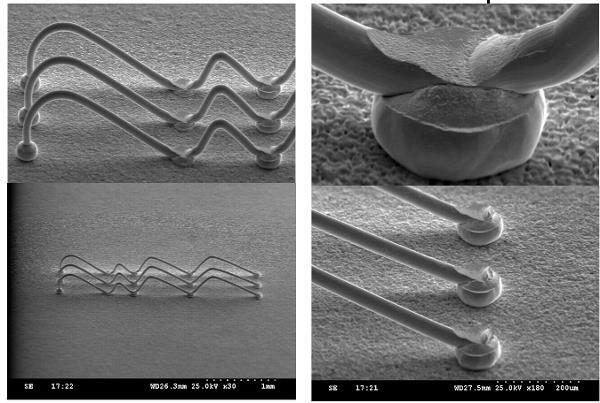 Wedge bonding speeds typically fall within 3-6 wires per second, comparatively slower than a ball bonder.